The First Intifada began on December 8th 1987 as a spontaneous response to murderous violence by illegal Israeli settlers and brought the Palestinian cause back to the global consciousness. The First Intifada would be driven by the occupied people themselves, and especially by the children and youths; it was a revolutionary cry for freedom by those directly under the military boot of the occupier. At least 1268 Palestinians would be killed by Israel’s occupation forces’ and Israeli ‘civilians’ by the time the Oslo-era began in 1993 with its false promises of coming liberty, that would be betrayed by Israel’s regime and United States, the self-appointed ‘honest broker’. 161 members of Israel’s occupation forces, illegal Israeli settlers and civilians in Palestine 1948 would die also, with 53 of them civilians outside the occupied territories. Hundreds of Palestinian children and couple of dozen of Israeli children were killed, but as we have been unable to find exact numbers (B’Tselem, whose statistics we otherwise used here, gives only the deaths of those of age 16 and under) we can’t report the child casualties exactly. Youth Ammar Abed-Rabbo al-Khatib was kidnapped last at dawn on Friday December 7th from the village of Hizma in occupied East Jerusalem by Israeli occupation forces. Like with so many other Palestinian families living under the occupation, to be taken at night from home by masked gunmen is not some shocking event beyond comprehension but part of what life is under the Israeli occupation. Ammar is a brother of political prisoner Amer al-Khatib and now joins his brother in captivity. Several homes in Hizma were raided and searched during the night by the occupation forces, which kidnapped also 3 other people from the West Bank during the late hours of the night. A Dutch activist has been demonstrating alone in Amsterdam for four and a half years to shed the light on Israeli aggression against Palestinians. Simon Froufni holds his demonstrations every Sunday in Dam Square in the Dutch capital Amsterdam, Anadolu reported on Friday. Froufni told Anadolu that he has organised more than 500 demonstrations since he began, distributing flyers about the Israeli occupation to the many tourists who visit the Square. In addition to shedding light on Israeli aggression against Palestinians, Froufni criticises the Dutch government for accusing pro-Palestine activities and organisations of being anti-Semitic. He stresses that his demonstration has nothing to do with anti-Semitism, but rather is a sign of respect for the Palestinians. Froufni also noted that he was detained 15 times because of his response to the provocations of pro-Israeli activists, who have been harassing him for two years. “One time, the court ruled that a former Israeli soldier who tore my coat must pay compensation to me,” he explained, stressing that he will not allow such attacks to stop him demonstrating. Palestinian President Mahmoud Abbas said late Saturday evening that the Hamas-dominated Palestinian Legislative Council will soon be dissolved, Palestine’s official news agency reported. Addressing a conference in the city of Ramallah in the occupied West Bank, Abbas announced that the council would be dissolved “in a legal manner,” without giving a date for the move, which is likely to be opposed by Hamas. Rather than Abbas’ Fatah movement, its rival the Hamas movement holds most of the seats on the council. The council was disrupted following the Palestinian administrative division of 2007, when two competing Palestinian governments emerged. Of the council’s 132 seats, 76 are held by Hamas, Fatah has 43, and the left wing and independents hold the remaining 13. Fatah Central Committee member Dalal Salameh told Anadolu Agency in May that the Palestinian National Council (PNC) – the legislative body of the Palestinian Liberation Organisation (PLO) – was discussing the mandate of the Palestinian Central Council (PCC) to carry out the powers of the Legislative Council. The Central Council is a permanent body of the PLO-affiliated PNC, the highest representative legislative body of the Palestinian people, which includes the Palestinian factions, except Hamas and Islamic Jihad. On more than one occasion, Hamas has declared its refusal to dissolve the Palestinian Legislative Council, saying Abbas has no power to dissolve it. The Palestinian Basic Law provides for the holding of parliamentary elections every four years, but the last parliamentary polls took place in 2006, over a dozen years ago. The West Bank and the blockaded Gaza Strip have remained politically divided since 2007, when Hamas wrested control of Gaza from rival group Fatah following several days of bloody street fighting. Hamas’s capture of Gaza in 2007 ended a short-lived unity government established after Hamas swept the 2006 Palestinian legislative polls. Since then, Hamas has been in control of the blockaded strip’s border crossings. This October, Hamas and Fatah signed a landmark reconciliation agreement in Cairo aimed at ending 10 years of bitter division. If it holds, the agreement will allow the Fatah-led Ramallah government to assume political and administrative responsibility for the Gaza Strip. On Friday evening, 07 December 2018, Israeli forces wounded 72 Palestinian civilians, including 11 children, 1 woman and 2 paramedics in the peaceful demonstrations in the eastern Gaza Strip despite the decreasing intensity of the demonstrations there for the sixth week consecutively and absence of most means usually used during the demonstrations since the beginning of the Return and Breaking the Siege March 7 months ago. According to observations by PCHR’s fieldworkers, for the fifth week since the beginning of the Return March on 30 March 2018, the demonstrators abstained from burning tires while the attempts to cross the border fence and throw stones and incendiary balloons were completely absent. Though the demonstrators were around tens of meters away from the border fence, the Israeli forces who stationed in sniper positions and military jeeps along the fence continued to use excessive force against the demonstrators by opening fire and firing teargas canisters at them, without the later posing any imminent threat or danger to the life of soldiers. At approximately 14:30, thousands of civilians, including women, children and entire families, started swarming to the five encampments established by the Supreme National Authority of Great March of Return and Breaking the Siege adjacent to the border fence with Israel in eastern Gaza Strip cities. Hundreds, including children and women, approached the border fence with Israel in front of each encampment and gathered tens of meters away from the main border fence. Further, setting fire to tires and throwing stones, incendiary balloons and Molotov cocktails were almost absent. The demonstrators gathered in areas open to the Israeli snipers stationed on the top of the sand berms and military watchtowers and inside and behind the military jeeps. Despite the prevailing calmness, the Israeli forces fired live and rubber bullets in addition to hundreds of teargas canisters, particularly in eastern Jabalia, Gaza and al-Bureij refugee camp. 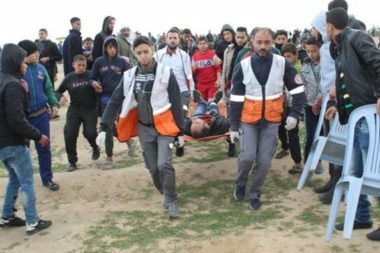 The Israeli shooting, which continued at around 17:00, resulted in the injury of 72 Palestinian civilians, including 11 child, 1 woman and 2 paramedics. The injury of 3 civilians, including a child, was reported serious. In addition, hundreds suffered tear gas inhalation and seizures due to tear gas canisters that were fired by the Israeli forces from the military jeeps and riffles in the eastern Gaza Strip. PCHR emphasizes that continuously targeting civilians, who exercise their right to peaceful assembly or while carrying out their humanitarian duty, is a serious violation of the rules of international law, international humanitarian law, the ICC Rome Statute and Fourth Geneva Convention. Thus, PCHR calls upon the ICC Prosecutor to open an official investigation in these crimes and to prosecute and hold accountable all those applying or involved in issuing orders within the Israeli Forces at the security and political echelons. PCHR hereby condemns the excessive use of force and commission of crimes by the Israeli forces despite the prevailed calmness, believing it is as a result of Israel’s enjoying impunity thanks to the U.S. and so encouraging the Israeli forces to commit further crimes upon an official decision by the highest military and political echelons. 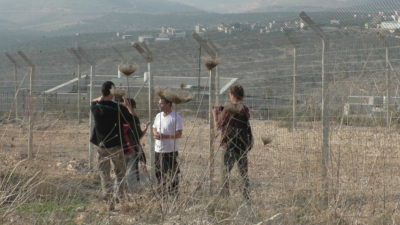 In the area of Salfit, harassment by settlers is a regular occurrence. They come to the villages, often late at night, to graffiti messages of hatred, and also vandalize cars and property. New settlements are being established frequently and are rapidly expanding. Farris is a university teacher living in the village of Kufr al-Dik. He drove us to his land of Deir Samaan, a beautiful olive grove with panoramic views, and a complex of Roman ruins at it’s heart. It’s only a stone’s throw from his village, but we had to drive 15 minutes extra, as the occupation’s gate to the village’s main entrance has been closed for three weeks. 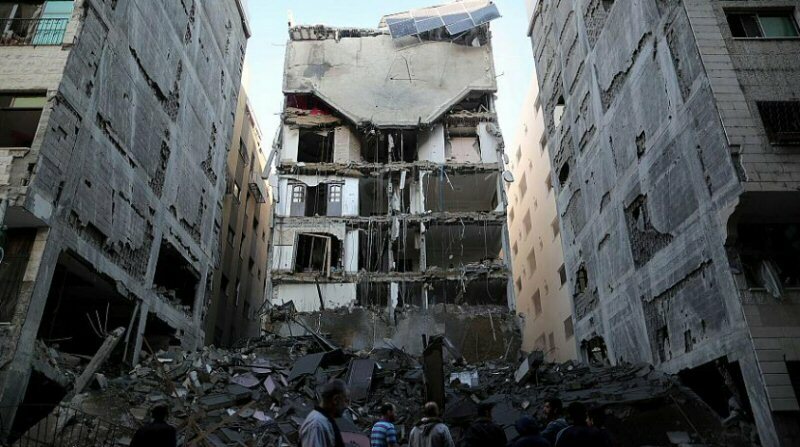 This is a common practice of collective punishment inflicted by the army. Farris and the rest of the village were perplexed as to why they were being “punished” just now. Up until now, it’s still possible to access Farris’ land, but one must pass the brand new constructions of Leshem, and an array of JCBs and cranes. 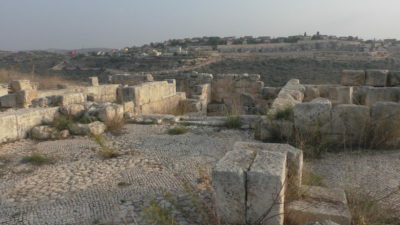 Leshem appeared in 2010, and now hugs the west edge of Deir Saaman. It is the newest of many illegal settlements that now surround him. This year a further 1200 units were added. 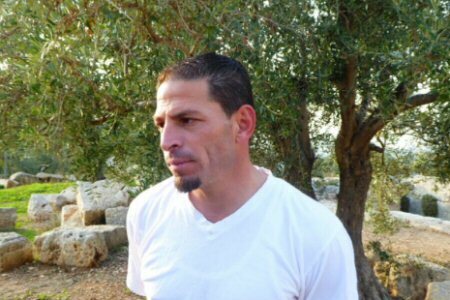 In the midst of the interview a Settler nonchalantly strolled through the middle of Farris’ private property. Farris tells us that many of the ornately carved Roman stones have been destroyed by settlers. They often enter, vandalize the ruin, and also swim in his well occasionally. The crescent has now expanded around to the South side of the property, with a new double fence, only a few weeks old, completely surrounding him. He was recently notified that he’ll soon be locked out from his olive trees and will have to obtain permission from the Israeli military to pass through. Based on previous cases, it’s likely he’ll only get permission for a few days a year to harvest olives. “Israel is annexing everything from the green line to the Jordan Valley. That is a big finger which cuts across the middle of the West Bank” he explains. 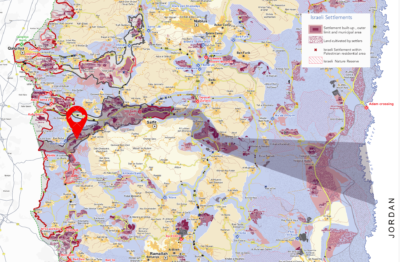 It’s clear that the settlements are being strategically planned and positioned. There are now 24 settlements in the Salfit area and only 18 Palestinian villages. 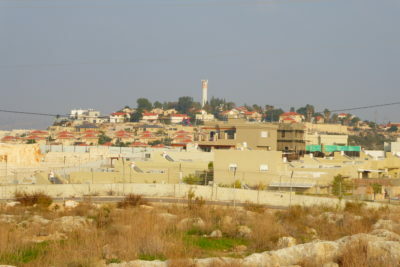 Ariel, at the top of the valley from Farris’ land, with a population of around 20,000 is one of the largest settlements in the West Bank. 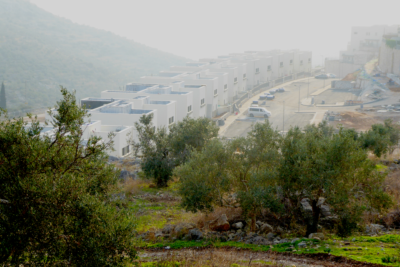 “They want to make Ariel a city, all the settlements you can see refer to Ariel”. Just bellow Ariel is a huge Israeli industrial area called Barkan. Palestinians have suffocating restrictions on what they can build. For example, they are prohibited from building industrial facilities. Whereas Israel has managed to flaunt International laws, and even Israeli laws, to establish these massive industrial zones, thus giving Israel evermore control over the region, and the Palestinian natives. Barkan employs many Palestinians. At a time when unemployment is very high in the West Bank, the Palestinians take the work out of necessity, receiving much lower wages than their Israeli colleagues. Working for your illegal occupier is beyond humiliating, and gives rise to intense frustration. It’s not surprising that this forces people over the edge at times. For land owners there is not always a choice. The accumulated obstructions and violent interventions take away the capacity to earn a living, forcing younger generations into accepting the low wages at Barkan. Traditional ways of village life are eroded, land is left untended, and therefore open to settler land-grabbing, as per Israeli law, and against international law. The objective is obvious, frustrate the occupants into leaving, or act out so as to be thrown into prison or worse, leaving the land empty. Sewage and waste from all settlements, and the Barkan industrial complex, is emptied on to the fields of Palestinian farmers. This is causing a big loss of income, there are also significant cancer clusters within the villages of the valley below. Former Israeli Prime Minister and Defense Minister Ehud Barak ordered the targeting of densely populated areas, in the 2008 war on Gaza. The revelation was made yesterday by Israeli newspaper “Maariv”, which reported that Barak had been frustrated with his failure to stop the firing of primitive Qassam rockets, from the besieged Gaza Strip. In response, he ordered any location from which the rockets were fired to be hit with 155mm artillery shells, regardless of the population density and the destructive consequences of the proposed shelling. However, according to Days of Palestine, Barak’s order was denied by then Chief Military Advocate General Avichai Mandelblit, who told the prime minister: “The order you want to be approved by the chief of staff is illegal”. Mandelblit – who is now Israel’s Attorney General – stressed that Barak would be “defined as a war criminal” and could be “convicted by the International Court of Justice at The Hague,” if he went through with the order. Mandelblit suggested that, though rockets could be fired from densely populated areas, this does not justify turning the civilian area into a military target. In addition, Mandelblit said that it was necessary to “respond with weapons with high precision when it comes to a specific target, rather than responding with a shell which causes shrapnel to scatter in a very wide area,” stressing it was “very doubtful” that artillery shells would hit the target. When Mandelblit rejected the order, Barak met with him and then Chief of Staff Gabi Ashkenazi. Barak claimed that Mandelblit was not the army commander, but rather that Ashkenazi was, and so he should carry out the order as instructed. 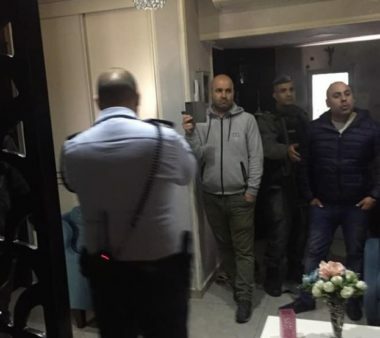 Israeli soldiers invaded, Sunday, the home of Jerusalem Governor Adnan Gheith, in Silwan town, south of the al-Aqsa Mosque, in occupied East Jerusalem, and took measurements of the property. Dozens of soldiers surrounded the Governor’s home, before breaking into it using excessive force, and conducted provocative acts against the family. The soldiers then took measurements of the property, a move which is usually followed by a demolition order, but did not hand him any order. It is worth mentioning that Gheith was placed under house arrest,an order which expired Saturday, and was frequently abducted and detained by the army, in an attempt to prevent him from performing his duties. The ongoing arrests and violations are part of Israel’s measures aimed at preventing the Palestinian Authority, and various institutions, including the UNRWA,its facilities and clinics,from providing services in East Jerusalem, including its surrounding communities.